French President Nicolas Sarkozy has said "something isn't right" with the European Union, as France took over the rotating presidency of the bloc. Speaking on national French TV, Mr Sarkozy warned that Europe's citizens were losing faith in the project. 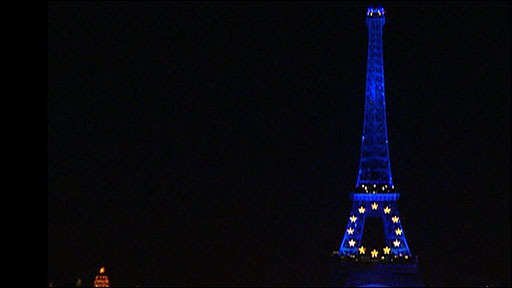 Correspondents say France's grandiose EU presidency plans are in doubt after the Irish Lisbon treaty No vote. Poland's president reportedly said it would be pointless for him to sign the treaty, given Ireland's rejection. Lech Kaczynski told Polish daily newspaper Dziennik he would not approve the document, even though it has been ratified by Poland's parliament, reported AFP news agency. France has set out ambitious plans on immigration, the environment, agriculture and defence for its six months at the helm of the EU. But as he took over the presidency from Slovenia, Mr Sarkozy said his priority would be to get all the other EU states to approve the treaty and then see what could be done. The treaty cannot come into effect until it has been approved by all 27 member states. Can French flair beat EU blues? In Germany, ratification is also being delayed, with the President, Horst Koehler, saying he would wait to sign the treaty until after the country's highest court had delivered a ruling on legal challenges. The document is meant to streamline EU decision-making following enlargement of the bloc. It is also meant to create a new EU president and foreign affairs chief, appointments which France is supposed to oversee at the end of its tenure. But the BBC's Hugh Schofield in Paris says last month's Irish rejection of the treaty means once again it is the EU's institutional shape - rather than anything it can actually do - that is in the spotlight. 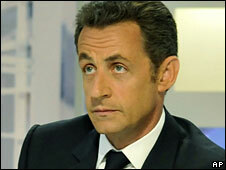 Speaking on France 3, Mr Sarkozy said: "Something isn't right. Something isn't right at all." "Europe worries people and, worse than that, I find, little by little our fellow citizens are asking themselves if after all the national level isn't better equipped to protect them than the European level," he added, calling such thinking a "step backward". Mr Sarkozy said: "The first priority is to pinpoint the problem with the Irish voters and to continue to allow other countries to be ratified, especially our Czech friends." Asked if Ireland should vote again, he said: "I don't want to say it like that because it would give the impression of forcing their hand." Mr Sarkozy will travel to Dublin on 11 July to hear Irish voters' concerns first-hand, a day after he presents the priorities of the French EU presidency in an address to the EU parliament in Strasbourg. EU leaders are due to meet in October to hear from Ireland's prime minister on how to move forward after the "No" vote. Mr Sarkozy also said that during France's EU presidency he would work for a Europe-wide cut in value-added tax on restaurant bills and oil to help consumers cope with soaring crude prices. 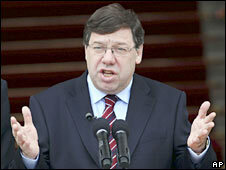 But his call for the EU to cut VAT on fuel has received little support from other member states. Mr Sarkozy and Prime Minister Francois Fillon are to kick off France's stint at the EU helm by meeting European Commission President Jose Manuel Barroso on Tuesday afternoon. A ceremony will be held afterwards at the Arc de Triomphe in the French capital. Is the current EU bail-out the right strategy for Greece?